Matthew Quick’s The Silver Linings Playbook is something of a mini-masterpiece. It’s difficult for an author to balance comedy and drama (it’s much easier on film), but Quick manages to do it. He delivers a novel which is light and breezy to read, but one which also has considerable depth. 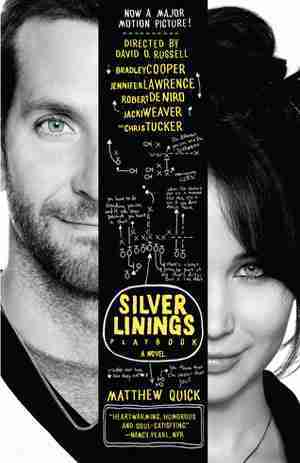 The beginning of The Silver Linings Playbook sees Pat Peoples released from a mental health institute into the care of his parents. Peoples suffered a breakdown following his separation from his wife, but he believes that their ‘apart time’ will come to an end once he gets his life back on track. Pat has now dedicated his existence to being a better human being, physically, mentally and emotionally. He’s working out on a daily basis and reading ex-wife’s English syllabus in the hope that he can connect with her on an intellectual level. However, the people around Pat have changed since he went away to ‘the bad place’ and he has to try and comprehend a world which is now alien to him. His father can no longer talk to him, except by communicating through football, ‘Eagles, Arrrrhhhhhh’. Pat’s brother feels guilty for having abandoned him during his time away and even his loving mother now appears to be a different person, walking an emotional knife edge. He’s trying to understand these changes when he meets Tiffany, an individual who is even more damaged than he is. The pair strike-up an unlikely friendship, a friendship which helps them both emotionally, but one which is far from clear cut. The Silver Linings Playbook feels real. The situations, the characters and the tone of the book all fit together perfectly. The character of Pat is broken; you can’t help warming to him, but deep down you are also aware that he may not have been such a likeable character in his past. He’s looking for redemption, a silver lining in his cloudy life. As a character, Tiffany could have been very one note, comic relief, or even worse a ‘Manic Pixie Dream Girl’, who is only there to be Pat’s romantic foil in a ‘will they or won’t they’ scenario. However, she’s fully rounded and a little bit creepy – in another world she wouldn’t be far removed from Glenn Close’s character in Fatal Attraction. It’s a cliché to say that The Silver Linings Playbook features a ‘roller coaster of emotions’, but it does. It moves from comedy to drama with ease and it is difficult not to get caught up in the very real world which Quick has created. It’s a book that deals with a lot of important themes, the main one being mental health, but it doesn’t come across as preachy – but it will make you think. David O. Russell’s film adaptation (starring Bradley Cooper and Jennifer Lawrence) is getting ready to hit screens, and although it looks like Russell has made a few changes, it does appear to be a faithful adaptation of Matthew Quick’s novel. If you’re intrigued by the film, you should read the book, and even if you’re not grabbed by the film you should still read the book –just so you can understand that every cloud does have a silver lining.